“One can always find something lovely to look at or listen to.” – from Anne of Windy Poplars by Lucy Maud Montgomery. I ran across this line while re-reading some of the Anne of Green Gables novels during the last days of winter and, as I began writing about it, found “something lovely to look at” outside my window. 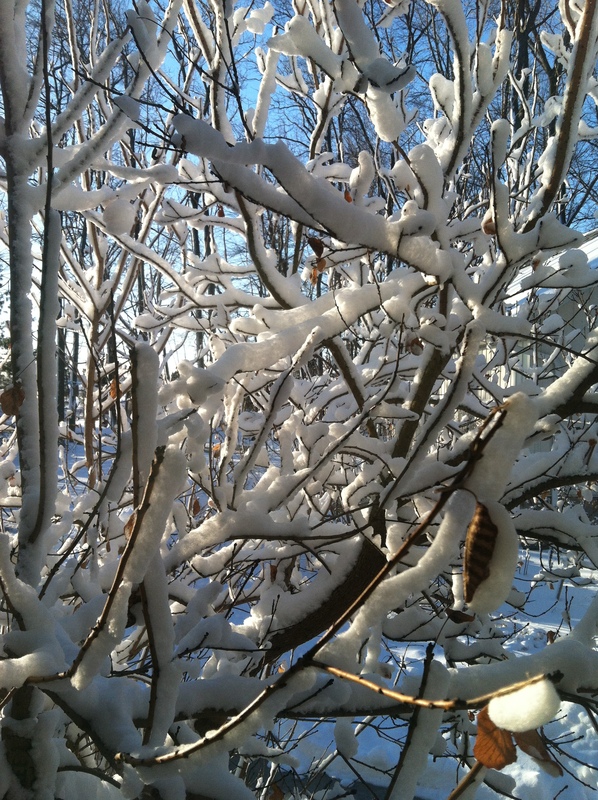 A snowstorm had sheathed the trees in white, turning the barren scene into a wonderland, especially when the sun added a glow. Anne would have been pleased at the sight, though I think she would have gone into greater raptures about it than I have done here. 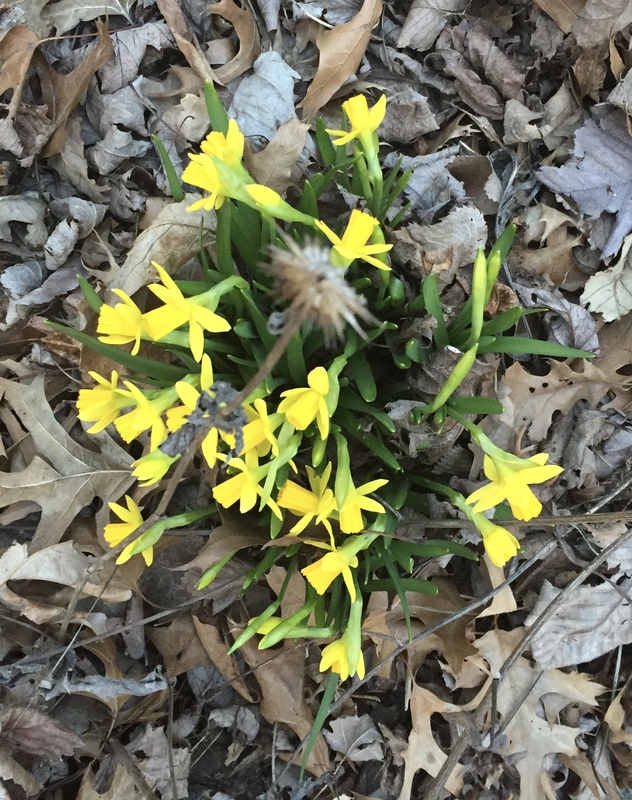 These miniature daffodils are among the first blooms of spring in our garden. Now, with the approach and finally the onset of spring, it has been much easier to find lovely things to see and hear. The first miniature irises and daffodils have bloomed in the garden, and foliage from other plants is poking through the cover of dead leaves. Our bird population is changing, as evidenced by the chatter of blackbirds, punctuated more recently by the call of an Eastern Phoebe, and sightings of a pair of Fox Sparrows, a cloud of buzzards kettling overhead, and two Eastern Meadowlarks in a field outside the woods. 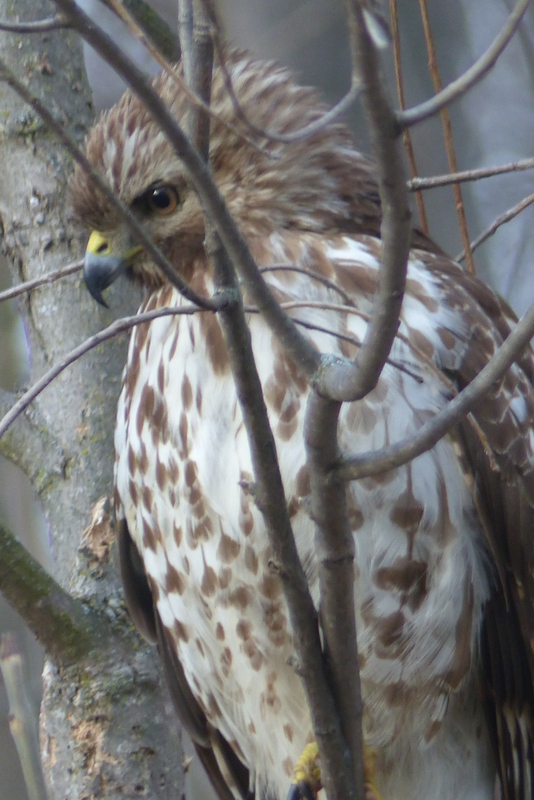 Amid this, a Cooper’s Hawk added to our delights by alighting near the pond and mugging for our camera as he surveyed the property for food. Such lovely somethings and the joy they bring are the sweet reward for those of us who fully experience the darkness and cold of northern winters. But the lesson of Anne of Green Gables is to find them in all seasons, whether gray or green. Anne’s example and that of others encourages me to be constantly on watch for “something lovely,” and especially to seek it out on days when it seems absent. My husband, who has a lifelong habit of observing the landscape wherever he happens to be, has been a great teacher in this regard. He learned as a child to scan a horizon, a stand of trees, a seashore, or even a span of power lines for “something out of place,” “something that doesn’t fit.” So it is that he frequently sees Bald Eagles and hawks while working outside, looking through a window, or driving, and is the first to catch the movement of Wood Ducks flying through the trees or a Northern Harrier swooping over a field. In fact, lovely somethings seem to find him, almost as if they hone in on his receptivity. I am pleased to be the beneficiary of his sightings, and, thanks to his coaching, occasionally have my own, as happened recently when I heard, then spied a flock of swans in the field abutting the lane where I walk. Had I not been alert to the possibility of “something lovely” that day, I might have missed this pleasant scene. Indeed, it was a morning when the shabbiness of a gray, foreboding sky, muddy fields, and the chill of the air conspired to distract me from thinking about anything of beauty. But living like Anne – and my husband – demands resisting acquiescence to appearances. It requires a willingness to believe that another layer lies beneath what we see and the resolve to delve deeper to find it or to wait for it to be revealed. When I don’t do this, I miss opportunities, as I did some years ago when I noticed a bearded, elderly priest had joined the ranks of the residents at a home for the aged I sometimes visit. He had a kind of poetic bearing, almost that of a hermit who spent his days in the desert and his nights in a cave. One of the residents told me he was very holy, but it wasn’t until some time after his death that I learned he had been a prolific author and noted figure in certain religious circles. As he lived out his last days in relative obscurity, I had observed him and been intrigued, but apparently not enough to go deeper to discover who he was. Clearly, I overlooked a treasure in my own backyard. Writer and naturalist Cindy Crosby could easily have done the same when she moved to a seemingly barren Chicago suburb after having lived in settings with more apparent natural beauty. In By Willoway Brook, she tells how, though less than enthused about her new location, she focused on “the landscape at hand,” noting the birds in her backyard and putting up feeders to draw them in. Then she discovered a tallgrass prairie nearby – and in it more birds. Soon, she saw “the possibilities that lie within exterior and interior landscapes” as the prairie became for her a metaphor for prayer as well as the motif for her work and writing. 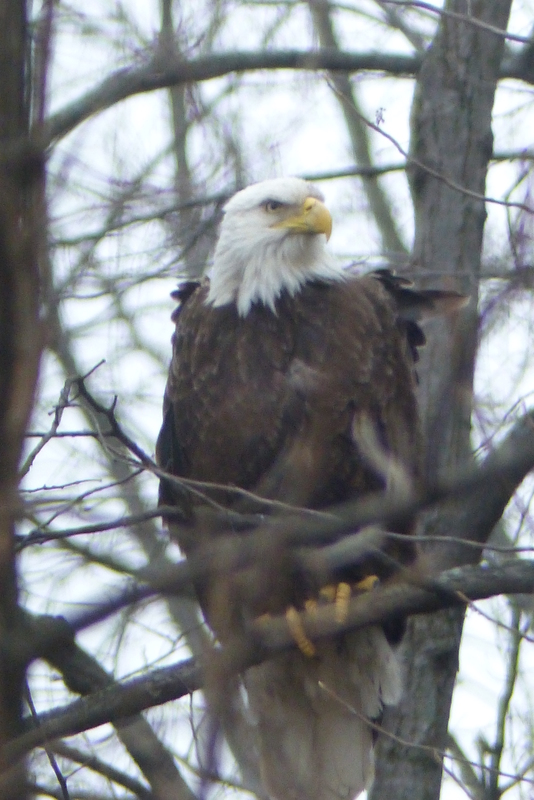 One of the Bald Eagles my husband spied recently. But then for Anne, the stretch of road the locals called “the Avenue” was the White Way of Delight, Barry’s pond was the Lake of Shining Waters, and the spring by the log bridge was the Dryad’s Bubble. In the final Anne novel, Rilla of Ingleside, World War I has cast a shadow over everyday life, but Anne and other “kindred spirits” still keep watch for the lovely, even when sorrow descends. For that, they are the richer, finding the light in the darkness and uncovering the marvelous in the seemingly mundane. For my part, I think I will stick with them, rambling through the seasons, looking for loveliness everywhere, and expecting to find it.